Modern trends often tend towards space saving and minimalist styles, but this isn’t for everyone. Sleek lines and geometrically creative pieces are not always popular with everyone, especially with those seeking a classic feel. When it comes to bathrooms, sticking to traditional influences doesn’t mean that a bathroom is no longer beautiful or space efficient. Many classical designs offer understated elegance that never fail to impress. To help you distinguish the elements that create the timeless and classic look, I have put together a list of the 8 traditional features of a classic bathroom. While pedestals might have fallen out of favor for their lack of storage space, their clean lines create the classic, simple design of a period piece. While it may not offer the storage of a typical vanity, the design does hide those unsightly pipes. Another bonus is that instead of two vanities, or one long vanity that features double sinks, two pedestals placed side by side can look beautiful. They are particularly notable when paired with a classic, beveled style mirror. If covering up the pipes isn’t an issue, which is the case in many classic bathrooms, a classical washstand gives new life to a boring sink. This is like the antique version of the vanity. It can be an eye-catching feature, especially when paired with the right kind of faucets and other décor. Accents like subway wall tiles, mirrors in unique hexagonal or octagonal shapes, and checkered floor tiles can also be tied together with a vintage and classic style washstand. Many modern faucets look like pieces of art with their uniform design and elegant pour style. But the mark of a more classical bathroom is cross handle faucets. Cross handle faucets don’t have to be dated, either. Both angular and curved styles are available, and both work well with washstand basins or pedestal sinks. 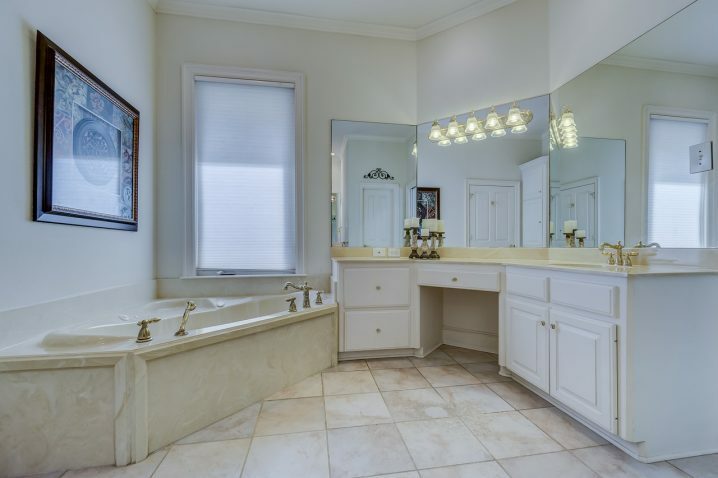 In any classic bathroom, a claw-footed tub is almost always the first to come to mind. These pieces are hallmarks of a classic design, and they are a timeless luxury. To date the tub and maybe add a pop of color, the sides can be painted. Pairing this tub with the right wall paper and a vanity with a marble top ties a classic bathroom together. Be sure that you don’t overwhelm the design though. This kind of tub is definitely a piece to showcase. Along with the claw foot style is the slipper style. This is another free-standing tub that was originally Victorian in design. It’s called a slipper tub for the ability it gives the bather to slip beneath the bubbles with one side having a higher back. Yes, combo showers and baths are all the rage in modern homes. Typically, they feature lots of glass and stainless steel. But a standalone shower ring placed over your freestanding slipper or claw foot tub is an excellent way to add the convenience of a shower to the soaking tub while maintain the traditional air. The wooden paneling that lines the lower part of the walls in a house is an effortless way to add a classical vibe. Utilized in a bathroom, it is perfect to add a timeless and classical feel, especially when paired with the previously mentioned classical features. While many modern color schemes opt for neutrals, or all white, pops of color, especially colors that are notable for their appearance in specific time periods, are an easy and fun way to enhance the classical feel of a bathroom. Think minty green tiles or slim borders of black. Color doesn’t have to be specific to wall or tile color. Fixtures and furniture can be colored to give a more classical look. The best bathroom renovations are often the ones with traditional and classical styles. The classic look is simple and timeless, and an easy way to ensure a relaxing bathroom area. While modern styles have their place, classic lines are simply the way to go for elegance that is homey too.